A boy and a girl in one body.... An old man and a panda in one body!! This is no old mystery of sphinx in Egypt! The answer is so simple, and one thing for sure – You never know what will happen to you in the very next moment!! Amazing setting and well-structured plot by Rumiko Takahashi. Heart warming love story with smooth comedy taste. Originally serialized in weekly Shonen Sunday by Shogakukan. 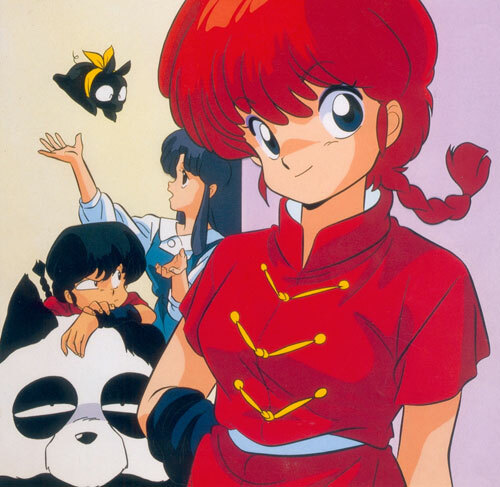 Ranma Saotome, the main character of the story, goes to China with his father, Genma to learn martial arts. There, they fall in a spring, which whoever falls into would change to different forms. After falling in the water, Genma is transformed into a panda while Ranma is transformed into a girl and now both must live their comic destiny. They can return to their original form by showering themselves with hot water. When they return to Japan, they live off the family Tendo, where the daughter, Akane is Ranma's fiancée. Ryoga is attracted to Akane while Kuno is attracted to both Akane and Ranma (in his female form). They are also involved in fights with Shampoo, a beautiful girl who has come from China and her fellows, as she loves Ranma when he is transformed into a girl. It is a slapstick comedy with fierce battles and hilarious transformations.